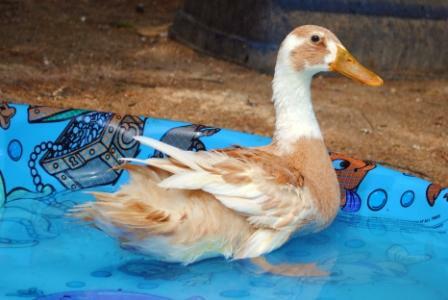 It’s finally been warm enough here lately that we can fill up Paddy Duck’s little swimmy pool and let her get some water exercise. I’m still amazed at how much I love ducks – they are cute, they are smart, they are a hoot to watch. Paddie’s grown into quite a lovely duck, and quite a good watch-duck. She’ll quack noisily whenever anyone comes down the driveway or opens the front door. And now, she has some non – chicken company. Remember those little ducklings we brought home almost exactly one month ago? They’re now big enough to be outside. 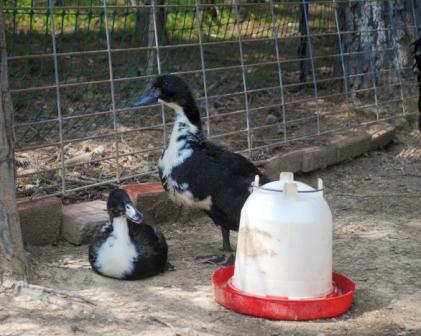 That’s right, those huge ducks (“Fanny” and “LeQuack”) are just over a month old. In fact, they’re big enough that Paddie is rather nervous around them. I’m pretty sure we have a male and a female there. I’m hoping so, anyway. 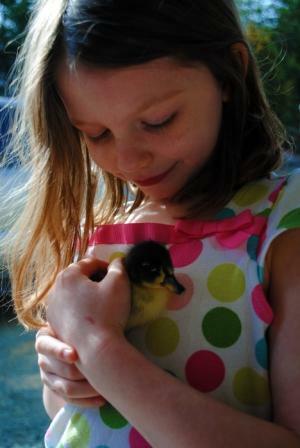 In Paddie’s case, we’re fairly certain she’s a “she”, but as we have had no duck eggs yet…..we have no concrete proof. Two females and a male would be a happy trio. Here’s hoping! Our poor ducks (not ‘mine’, but the wild ones) don’t fare so well out here. Eagles. Lots of eagles. With my ducks you could tell by their voices as soon as they stopped peeping. The females quack/honk and the males sort of have a throaty -froggy sound. Males also have a “drake feather” that curls up at the top of their tail. I don’t know when that develops though… Good luck with them! If you want some hatching eggs of mixed colored runners, I can hook you up. You could put them under a broody chicken or in an incubator. i think i need a watch duck.